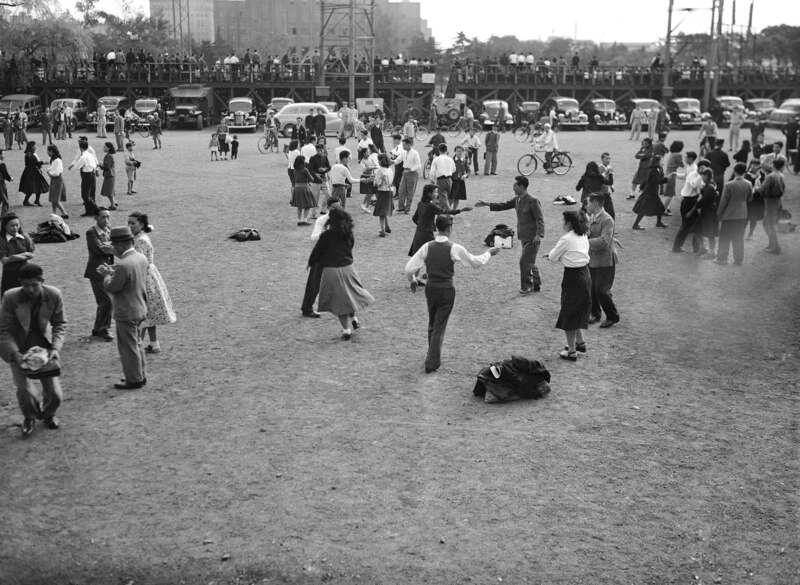 I, like every good Canadian, did a unit on square dancing in public school. It was the usual “don’t-make-me-touch-the-boys-they-have-cooties” kind of experience that you probably had in your school. Despite the potential for cootie infection, the activity itself interested me. The combination of math, music, and rhythmical movement appealed to my 12 year old self somehow. Kudos to my Grade 6 teacher for all of the above. Fast forward twenty years, and I find myself living in Japan looking at an ad for a square dance club in my city, Tsukuba. I hadn’t thought of square dancing very much over the intervening years, but I still had that general fondness that accompanied the idea in my head. I considered attending the beginner class in 2002, and in 2003 and every other year, until I finally delivered myself to the community center and started my journey of learning in 2007. I am not sure what held me back for those five years, but I do know what brought me to the class after all that time. It was a chance encounter with one of the former members of the club. This person had been a member of the Tsukuba Square Dance Club for a number of years before returning to the U.S. She and I were having dinner during her brief return visit to Japan when, somehow, the topic of square dancing came up. She strongly encouraged me to join the class and that, for some reason, was enough to make me take the plunge. I am reporting on this as a way to explain that while I am Canadian, I have never been a square dancer in Canada other than during that brief stint in Grade 6 with the cootie-infested boys. This means that I am not able to answer any questions about square dancing in Canada or the U.S. despite the fact that everyone in Japan expects that I can. I have asked around in various places, and one of my friends here in Japan recently relocated to the U.S. and is reporting back on her experiences, so I have a general sense of some of the differences between the North American model and the Japanese model, but I am very much more well-versed with how things work on this side of the Pacific. First of all, I think I need to explain how my club works so there is a context and a set vocabulary for this explanation. My club has four different kinds of events. Regular Meetings – The Japanese for this is 例会 (reikai), but think “meeting for dancing” rather than “meeting for talking”. This is our regular weekly event and it happens on Saturdays from 7:00pm to 9:00pm. This event includes Basic and Mainstream, and never anything beyond that. It also includes round dancing, and very occasionally a line dance (which is known as “country and western dancing” here, for some reason). The event is divided into seven tips of approximately 15 minutes each, and one 15-minute block for an “actual meeting”. The head caller divides up the tips among the club callers (more on callers later). From April to July, this time is mainly used for teaching new beginner dancers the Basic Program. From September to April, the beginner dancers learn the Mainstream Program and deepen their understanding of the calls through repetition. Workshops – Workshops in my club usually take place over a weekend. We all stay in an inn and square dance all the livelong day and night! We invite a caller to work with us for the two days on a particular theme that we have decided on ahead of time. This event is usually just for our own club members, although occasionally certain members of other clubs might be invited to join. Parties – Parties are arranged by various clubs throughout the year. A club will organize a party and invite other clubs (or individuals) to join. The club organizers also have “actual meetings” about once every three months to talk about the management of the club. In my club, there is a main organizing committee that is made up of various directors of various services (e.g. venue, website, snacks, etc.) and a “teaching committee” that is made up of the callers and cuers. The main organizing committee is in charge of club operations and the teaching committee is in charge of organizing the schedules for the meetings and beginner classes and deciding who will teach the beginners. Okay, please keep the above in mind when reading the following. There are usually different kinds of membership in each club. For example, you can be a “full member” or a “sub member” (not sure how to translate 準会員) or a “newsletter member”. These memberships each have their separate prices and privileges. Full members and sub members have the right to attend the regular and special meetings for free. (I think sub members have to be full members at their home club as a pre-requisite for becoming a sub member at another club.) Any non members who attend the regular or special meetings are charged a nominal amount per time. Club meetings/classes are normally around two hours long. Beginner classes usually start in April every year and go until the end of July. The debut party for beginners is called a “Dosado Party” and this usually involves several clubs in a particular prefecture (like a state, but smaller) banding together to introduce their beginners to the wider world of square dancing. Costumes are mandatory at the Dosado Party (and most parties in Japan). A “standard dancer” is expected to be able to dance at the Mainstream level. There are many parties that concentrate on Mainstream dances and throw in a few Plus tips for variety. Occasionally — and this is a more recent thing — there will be one Advanced tip, too. There are also separate parties for the Advanced and Challenge programs. Parties are often followed by more informal “after parties” that are usually held at a restaurant close to the party venue. Dancing doesn’t usually happen at the after party, but drinking usually does. Another difference is that callers do not get paid for calling at regular meetings/classes, or at many parties. Callers can sometimes receive reimbursement from their clubs for attending caller schools and other things like that, but usually there is not a lot of money involved in calling. (Or, rather, there is not a lot of money to be earned. There are, of course, lots of expenses!) If a caller is invited as a special “guest caller” to a major event then he or she will get paid, but otherwise there is a lot of voluntary calling happening. (This, obviously, doesn’t apply to a caller who is invited as a guest from overseas.) The money from the club membership fees goes toward the venue and the equipment, mainly, not the callers. I’m not sure if this is different too, but the callers do not usually own their own amplifying equipment here. The club buys the equipment (amps, speakers, etc.) and the callers buy their own microphones and cables. This means that clubs usually have an annual membership fee rather than charging at the door each night. My club, for example, costs around 10,000 yen (approximately $100) per year. Callers use all kinds of music, but country music is probably still the most common genre used. There doesn’t seem to be a big controversy about using “alternate music”, although the dancers probably do expect most of the music to be country-ish. There are not a lot of stores that sell square dance costumes and the various accessories that go along with them, so the costumes tend to be handmade by the club members. I have five or six costumes, and they were all designed and sewn by one of my club members. They are absolute treasures — both the dresses themselves and the people who make them! Costumes are usually required at parties, but the rules for meetings/classes vary. At my club, we try to wear our costumes at one meeting per month, but this doesn’t always happen, especially during the beginner classes. I have heard that foreign callers have had trouble with saying the word “go” after a call. “Go” means “five” in Japanese, so if you say, “square thru, go”, it will be interpreted as “square thru five”. If you have a habit of following your calls with “go”, you should probably try to fix that before you try to call in Japan! I have heard that dancers in Japan are more technically skilled than dancers in North America. I am not sure if that is true. I think the dancers are probably more serious, in general, but that is mainly due to cultural differences in thinking about hobbies. (People tend to take hobbies very seriously here.) One of my friends here says that big-name American callers tend to call at major events in Japan where only very skilled and confident dancers tend to be present, so it could be that they get the impression that all dancers are skilled through such experiences. The jury is out on this one for now. I’ll let you know what I think after I have experienced the equivalent of a “regular meeting” in Canada or the U.S.
I’m not sure what else is different. I am planning on trying to attend a square dance event the next time I am in Canada, so maybe I will report back on what I notice after I come back.